It is easy to keep a few species in a marine aquarium, to take advantage of their bright colors. These invertebrates are carnivorous: in an aquarium they should be fed on mussels, fish, or white meat. 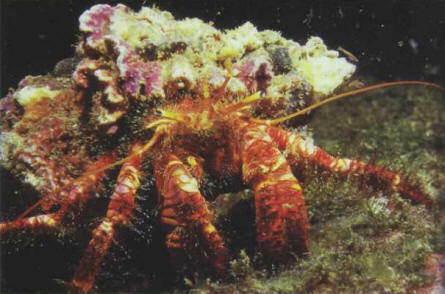 Hermit crabs are highly striking invertebrates which run around the aquarium in all directions to look for their food. They withdraw into their shell when frightened. These rarely swim and prefer to get about by walking on the decor. If they are disturbed they abruptly recoil by tucking up their abdomen. Several specimens can live together, but it is vital to keep them away from carnivorous fish. 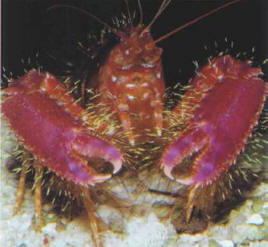 Enomotoplus sp., the lobster crab, related to the langoustine, is an attractive and placid resident. The small abdomen is tucked under the lower part of the body. Their pincers are particularly well developed. The larger specimens, which can be aggressive, must not be put into marine aquariums, as they can attack other invertebrates, and sometimes even fish. These are better known as hermit crabs. Some tropical species can be found commercially, some of them bearing a small anemone on the gastropod shell which houses them. The shell is discarded when it becomes too small for the growing animal, so it is vital to provide bigger ones, as, unlike other crustaceans, a pagurid's abdomen is not protected by a carapace that it makes itself. ХРОМОТА ПЕРЕМЕЖАЮЩАЯСЯ , см. в ст. Эндартериит облитерирующий.